With over 12 million subscribers, Markiplier is one of YouTube's biggest superstars. Now he continues his hysterical cross-dimensional adventure in comics. 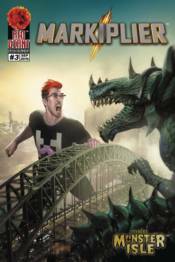 In this issue, he has to navigate the frightful worlds of Pandora's Blogs and Monster Isle where he faces off against horrors that make him scream like only Markiplier can!